You might hear many people say, “You will absolutely know when you are in labor”. Well what defines labor? Labor is when the cervix is becoming thinner (effacement) and opens (dilates) due to the uterus contracting at regular intervals. These signs include feeling your baby dropping down lower, also referred to as lightening. This makes for more room to breathe again due to the baby relieving pressure on your diaphragm! This also might mean that your baby may put some extra pressure on your bladder making for more trips to the ladies room. An increase in vaginal discharge that is clear, pink, or slightly bloody might also be noticed. This is referred to as normal show or your mucous plug. The name of the “mucous plug” makes it sound like it would be solid, almost like a cork, but it is not! It is just an increase of vaginal stringy discharge or mucous that serves to protect the cervical opening from bacteria. You do not need to come to the hospital when you pass your mucous plug, nor bring the mucous plug to the hospital! It does not mean you are in labor, it just means you are approaching labor. Not all women notice lightening or their mucous plug being released as each labor is different and yours will be just as unique! This is also referred to as “Braxton Hicks contractions”, this is your uterus training for your baby’s delivery! Just like a marathon runner runs daily to increase their muscle strength and endurance, your uterus will also train through Braxton Hicks contractions. Braxton Hicks contractions are when your belly tightens for a period of time and then relaxes, these contractions are weak in strength and do not get progressively stronger. They are often irregular and do not get closer together. They may even go away with a change of movement, or by going on a walk, or by resting. Braxton Hicks can be painful at times, although they are greatly less painful than true labor and are usually only felt in the front. True labor comes at regular intervals and continues to get stronger and closer together. The contractions do not go away with resting or with going on a walk. The pain usually starts in the mom’s back and moves to the front. When your contractions are consistently lasting about thirty to seventy seconds in length and are coming every five minutes apart it is time to call your health care provider! 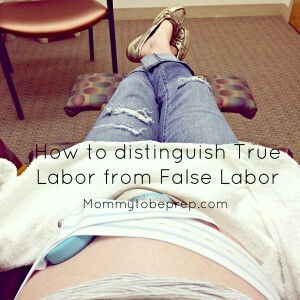 What if I still cannot tell if I am in true or false labor? If you cannot tell if you are in labor try to urinate and then drink a whole glass of water and rest as this can ease false labor pains. If the contraction pain continues, try walking around or a position change to see if this eases the pain. Pull out a clock and a piece of paper to time your contractions if you haven’t done so already. To time how frequent contractions are measure the start of one contraction to the start of another. Again, if they are coming consistently every five minutes or less you need to call your health care provider. Sometimes the only way to tell the difference from true and false labor is to see if the contractions are making cervical change, unfortunately this is not something you can assess by yourself. Only your nurse, midwife, or doctor may assess cervical change. If you have further questions if you are in labor or not, contact your gynecologist. Thank you so much! I appreciate the comment, hope you continue to enjoy! Hey there, You have done an excellent job. I’ll definitely pass it along to my friends. I will savor! I am printing this and packing it away for hopefully someday sooner than later! Very informative, please continue your writing! Found your website on Facebook, great post. I would love a to see a blog post on birth plans! Susan, I will have a post up regarding birth plans within the week! Keep updated! truly loved browsing your blog posts. I’m with Susan A. I would love a post regarding birth plans! Tayla! Thank you so much I truly do appreciate the feedback! I am currently working on a post regarding birth plans and will have it out published shortly!